A great memory quilt can be made for your sports enthusiast or athlete from a sports jersey collection. This is a guide about making a sports jersey quilt. I took all the softball jerseys from my granddaughter's years of playing softball and made her a huge quilt from them. She cherishes this quilt and it brings back lots of memories for her. Take the jerseys you have accumulated and make them into quilt squares. This is a neat keepsake. My son is in hockey and has a lot of jerseys. I am saving them and making squares out of them as he goes on. 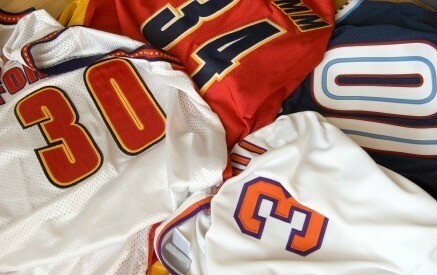 Each year could be a square (including practice, game and camp jerseys). It is such a neat idea. Will the edges of the jersey fray if not tucked under? More likely to curl some than fray. Maybe a small run here or there if the item is roughly handled. Jersey holds up well in that respect. Usually jersey fabrics will curl, but as the other poster said, sometimes jersey will 'run', too. Either way it's not an attractive finish on a quilt. You can make your own binding (see link below) or you can buy pre-made blanket binding to finish the edge, and you'll be a lot happier with the professional look to your lovely handcrafted quilt. Binding will also maintain the shape so the quilt will have a longer life. Probably not, but the raw edges of your seams may curl. Also zigzag seam finish would just make it look more finished. I am unable to locate instructions, to create a jersey quilt, out of fire dept. jersey shirts. Can you recommend a link of instructions? Try looking up TShirt quilts, Tshirt memorabilia quilts, I think that might get you more information. I just watched a show on TV that I think might apply to you called : "Quilting with Special Fabrics", on a PBS TV show called "America Quilts Creatively". And, because jersey is a knit & stretches somewhat, I'd follow the directions for the "minky" fabric, because "minky" is slippery, can't be ironed & it stretches quite a bit, what they did was use a light weight interfacing under it to stabilize it. ---> Hey, just in case you've never seen this show, It's REALLY good! And I don't even quilt! But at towards end of the show, the have a "technology" segment & I really like that! Not only do they teach you how to use quilting software for your computer, they show you how to do fun & unusual kinds of sewing projects. Lots of great ideas too!